Should I just update to the 3.0 plugin? I looked for it, but can't seem to find where to download it. 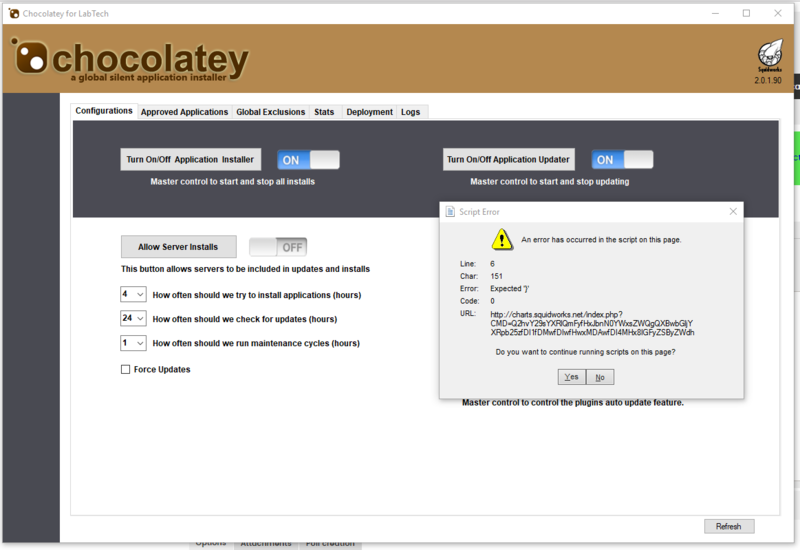 Also, is it possible to choose which agents to be added to chocolatey from an Automate group? What your seeing there is a Java error from one of the charts on the stats tab. This is typically due to some type of bad data in the database that is escaping the string we are sending and causing this error. On the Stats tab, right click over a chart will bring up a menu to allow you to view the raw HTML. You can review the data being returned by the Chart API to create chart. If no charts are visible the error windows should allow you to see the raw HTML. 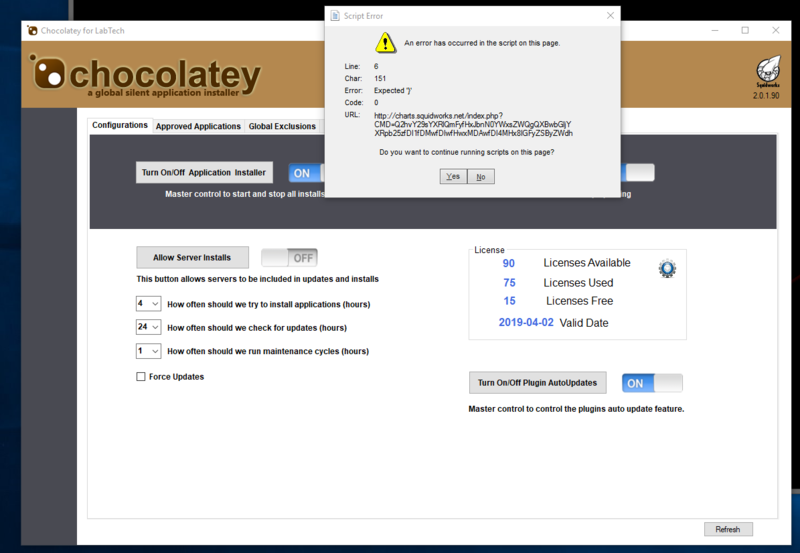 By selecting the "URL" in the error code window, copying that to a browser and running it directly in the browser will reproduce the same error but also return the JAVA code that failed so you can see the data in the HTML and decide what data and where it blew up. Then when you have the "column" of data that caused the error (something with uncommon char in it). Remove that data from the database and issue will resolve. This is typically some comma or semicolon some where in the data that is escaping the java code before it has completed. if you post the failed HTML data here from how I described it above, I will review the data and show you the fail point so you can go look for that in the data. It most likely will be an application name that has a " ; " or a " } " in it. If I load it this is what I get. Am I to install/replace that code somewhere? No what I am seeing for error is not a error indeed. It actually works for me as intended when I cut and paste your code. So are you saying that it is an unimportant error? Should I upgrade to the latest version? And if so, where is that downloaded? It is a chart error so one chart is failing to show. Can you post an image of the chart tab? I want to see what chart failed.. The one you sent is working so not sure which chart is broken for you. I don't see a "chart tab". Where is that?